Automatic Number Plate Recognition (ANPR) is the next growth product to take off in the world in fact, it is already beginning to be the biggest potential earner for installation companies. One problem is that it crosses technological barriers and the needs of available bandwidth were conveniently obscured. On the other hand ANPR technology is completely within the scope of knowledge of CCTV companies, although there are a few new terms and technologies to come to grips with. We will start by considering ANPR for a single lane using a dedicated camera and go on to discuss some other applications such as multi-lane systems and Town Centre systems with colour cameras. If you scan a document into your PC and then open it in a word processor you cannot edit or alter it in any way. This is because it is simply one bitmap made up of thousands of individual pixels. However there is software available, frequently a freebie with scanners that can convert these groups of pixels into characters. This is Optical Character Recognition (OCR), which scans each group of pixels and estimates whether or not it could be a letter and replaces the pixels with the ASCII* code for the letter. For instance the ASCII code for the lower case 'a' is 01100001. So, the software scans the whole document and produces a page of letters exactly the same as though you had typed them in, which can be edited or manipulated in any way. (*) American Standard Code for Information Interchange. 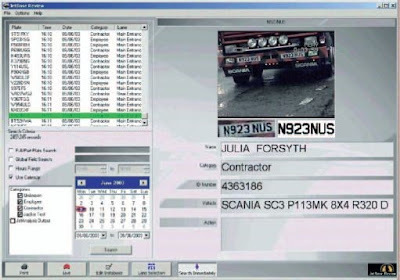 OCR is the fundamental technology used in ANPR and provides the capability to store and sort data. ANPR cameras need to be a special type and set up within certain important parameters as will be described later. As a vehicle approaches the camera the software takes a series of 'snapshots' and stores them in a file. When the number plate is of sufficient size for the OCR software the frame is scanned and the registration number is converted to ASCII code and held in a list. This continues for a series of images according to the speed and position of the vehicle. The list is scanned for similarities and a 'favourite' selected to retain. The system would typically scan and compare 10-15 images, with 5 being considered the minimum for high accuracy. Note that this is the principle of the software we are describing; some systems only take one image at a certain position. This then, is the start of the ANPR capture and is totally dependant on the correct set up of camera, lens, illumination, angle of view and configuration. Get one wrong and you have a disappointed customer who won't pay the bill. At this stage we are concentrating on the number plate capture but there are many other aspects to be considered for a completely integrated system, which will be discussed later. Note that the ANPR capture considered here is monochrome. 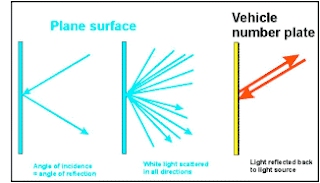 To explain some further technology behind successful ANPR capture we need to look at the behaviour of light. A basic law of light is that the angle of incidence equals the angle of reflection. However, number plates in the UK and most other countries have a special characteristic; they are known as RETRO-REFLECTIVE. The surface is covered in hundreds of tiny hemispheres which cause light to be reflected back to the source. This is the same technology used in safety clothing and signs. No matter from which direction the light is directed, it always reflects back and makes them very visible. If a standard colour or monochrome camera was focused to read number plates it would have to contend with a huge variety of lighting conditions, daytime, night-time, sunlight, backlight, headlights, and so on. One configuration simply would not cope with all conditions, so there is a need to provide a constant level and direction of illumination irrespective of any other conditions. And so we come to the development of special cameras for continuous capture of number plate data. The camera must be sensitive to the infrared part of the spectrum, to at least 850 nanometres. Then it must be fitted with a filter to restrict the visible part of the spectrum. The lens would have a manual iris set fully open and the shutter speed set to 1/1000th second. Finally an infrared source must be fitted adjacent to the camera. 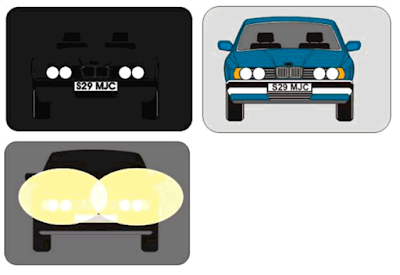 Therefore, taking advantage of the retro-reflective characteristics of number plates, the illumination from the illuminator will be reflected directly back to the camera. Thus only infrared light will be seen without any visible light or other reflections or refractions. The picture will of course be black with no detail except for the number plate. The OCR software then takes care of converting the image to usable code. Note that this is the sort of image on the monitor both day and night. This then is the core of ANPR technology, but there are many other factors to be considered. The first of these are the selection of lens and the distance to view the vehicle. The size of a UK license plate on cars and commercial vehicles is approximately 510mm long x 110mm high. Motorcycles are different being approximately 255 x 200. However more significantly, the minimum height of the letters must be 79mm. The current UK font is Charles Wright, although there are some illegal formats seen. 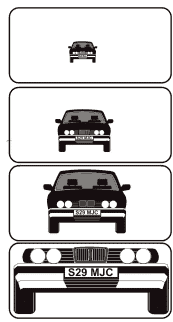 The size of the number plate and the actual characters will need to be of a certain size when seen by the camera for the OCR software to function. One line of thought is that the number plate should be 18% of the scene width; I prefer to consider the vertical height of the characters, which from previous research should be 3% minimum for a 400 line camera. This in fact equates very closely to the 18% screen width but is more logical when considering different shapes of number plates. (For instance when a car plate is 18% of the screen a motorcycle plate would only be 7 %.) Also note that motorcycles currently do not have to carry a front number plate, but this could change in the future. This provides the first convenient way to calculate the lens angle. For 79mm high characters the scene height needs to be 2633mm. (79 being 3% of 2633). Therefore using a scene height of 2.633M and the known distance, it is a simple matter to calculate the lens angle and thus the focal length. At this stage the height of the camera has not been considered but would not make much difference for normal combinations of distance and camera heights. (See further notes at the end).The following table shows the lens angle for various distances and a scene height of 2.633M. From this table you can find the nearest lens focal length for the sensor size. Where the focal length falls between two available lenses, a vari-focal lens can solve the issue. In instances where the camera height is large compared to the horizontal distance the number plate can produce the effect of being rotated vertically. It is important to check with the software provider if this is acceptable. Another very important consideration is the speed of the vehicles to be monitored and the width of the area to be covered. There are again two important interrelated elements connected with vehicle speed. One is the rate of the image grabber software the other is the speed of the processor. With modern processors the latter can no be ignored. Consider a vehicle travelling at 30 MPH, this equates to 13.4 Metres in one second. A UK camera produces 50 fields per second and the shutter speed is usually 1/50th second. In 1/50th second the vehicle would travel 0.27 Metres (268mm). This would cause a blurred image and problems with the OCR translation. For this reason the shutter speed should be set to 1/1000th second, in which case the vehicle would travel only 0.013 Metres (13.4mm). The same reasoning applies when trying to capture moving images with a 35mm camera. This is slightly less important when looking head on at a vehicle but becomes increasingly important when the vehicle is at an angle approaching the camera. Where the camera is positioned other than directly in the line of the approaching vehicle the ANPR provider must be consulted. Many systems will not function with more than more 1 or 2 degrees of horizontal skew or vertical rotation. Probably the best position is for a camera and illuminator in a 1M high bollard viewing directly at the approaching vehicle. This could be a pole mounted unit about from 18M to 30M from the vehicle. This is a special application requiring input from the ANPR provider. The first thing to address is the shutter speed if it is adjustable. The best would be if the speed can be set remotely, if not each camera needs to be visited and the speed set manually. The optimum setting is to 1/1000th. Alternative settings may be 1/250th for traffic up to 5 MPH and 1/500th for traffic up to 40 MPH. Note that all these settings will affect the low-light capability of the cameras and a compromise may be required. Another consideration is that the camera positions and heights would not be at the optimum for ANPR. Particular attention must be paid to the angles of skew and rotation and a guaranty obtained that an acceptable percentage of recognitions will be achieved. Again a special application requiring input from the provider. This application requires input from the ANPR provider and local authority before even starting to think of a specification. These are normally colour cameras mounted on a swivel mount and can view images to the front or either side of the vehicle. This is another special application requiring input from the provider. It is often necessary to have a conventional colour image of the vehicle especially where prosecution or congestion charging is the application. This would be a separate colour camera mounted alongside or just below the ANPR camera. Saving the overview image is triggered by the ANPR camera registering a number plate. This then adds a colour image to the same file for future reference. It is generally a false economy to attempt to combine the number plate recognition and overview using a single camera for 24/7 operation. There are thousands overseas vehicles on the roads today, many of them with symbols and other labels incorporated into the plate. The ANPR system must be capable of reading all of these. The software should have a built-in list of such plate styles. Just capturing number plates and storing them is not much use by itself. The screenshot below shows an ANPR example review screen. The associated database should be able to provide much more information. Notes added to image file. Counting vehicles in and out of premises, leaving a list of all vehicles on site. The length of time a vehicle is on site. Vehicle speed (from two cameras). Employee names can be associated with number plates and access allowed or denied to certain areas. The following table shows distances travelled for different speeds. This will give some indication to the number of images that be captured. From this table it can be seen that fof a vehicle travelling at 50MPH at 1/50th exposure it will travel nearly half a metre resulting in a blurred image. Compared to only 22mm at 1/1000th exposure. These are sometimes known as frame grabbers or field grabbers or stores. In reality they all store images or single fields. This is a particular area where you really pay for what you get. The main criterion is the speed at which images can be captured. For instance Video for Windows can only store about 8 images per second which is only suitable for very slow moving or stationary traffic. ANPR is the generic term generally used in the UK but other terms are common in other parts of the world. Such as; NPR (Number Plate Recognition), LPR (License Plate Recognition). To know more please click on License Plate Recognition 21st. The key elements that go into the solution are a competent IP camera and an analytic software that converts images to computer data. It is important that the camera is capable of capturing excellent quality images, as the analytics software is heavily dependent on this. SharpX is an IP-based automatic license plate recognition (ALPR) camera designed for demanding mobile and fixed applications. With its small form factor, high resolution and integrated illumination, the SharpX captures more license plates in a variety of conditions and at high speeds. Supporting up to four cameras connected to a single external processing unit. IntelliVision’s License Plate Recognizer is a deep learning and AI-based license plate detection, recognition and search solution with an accuracy as high as 98%. It takes into account variables such as movement and high speeds which are natural to the environment of vehicle monitoring. Real-time searching can also be performed on each plate detected, comparing the information gathered with a stored database of license plates. IP816A-LPC-v2 Kit represents a total solution for license plate capture (LPC) applications by leveraging the top-tier image quality and traffic monitoring ability of the IP816A-LPC box camera. The CaMate IR illuminator utilizing CVA Tech provides adjustable beam angles for different distances. A headlight filter is implemented to reduce instances of glare from direct headlight contact. The kit delivers clear license plate images for reliable recognition, in both the sunniest days and the darkest nights. Empowered with VIVOTEK Scene Mode, which provides different exposure levels to avoid overexposure in some lighting conditions, the kit can capture clear plate images from the vehicles moving at speeds of up to 85 mph (140 km/hr). ARES Viewer is a stand-alone application with an easy-to-use interface that allows widespread and quick access to vehicle recognition data and alerts in real time. It communicates vital information and allows users to view real-time data from anywhere, at any time, through a VPN connection to their network. ARES Viewer safely locks away the administrative power of the command center and makes plate and notification information available for each licensed user. Luxriot LPR is an automatic license plate recognition application that is designed to work with the Luxriot VMS Server. This application accommodates customers with the specific need to detect, recognize and register motor vehicle license plates, and then stores recognized license plates and snapshots on local or central database. Luxriot LPR, which supports a multitude of IP and analog cameras, is ideal for vehicle access control applications as well as for traffic control and enforcement applications. কলকাতার বেশ কিছু জায়গায় বসেছে অটোম্যাটিক নম্বর প্লেট রিকগনিশন (এ.এন.পি.আর.) ক্যামেরা।এই ক্যামেরা এমন বি়জ্ঞানসম্মত ভাবে বসানো হয়েছে যে নম্বর ছাড়াও গাড়িতে কারা বসে রয়েছেন, তাঁদের চেহারা এবং গতিবিধিও পরিষ্কার ধরা পড়ছে। অপরাধ দমনে যাহা গুরুত্বপূর্ণ ভূমিকা পালন করে চলেছে | জেনে নেওয়া যাক কি এই এ.এন.পি.আর. 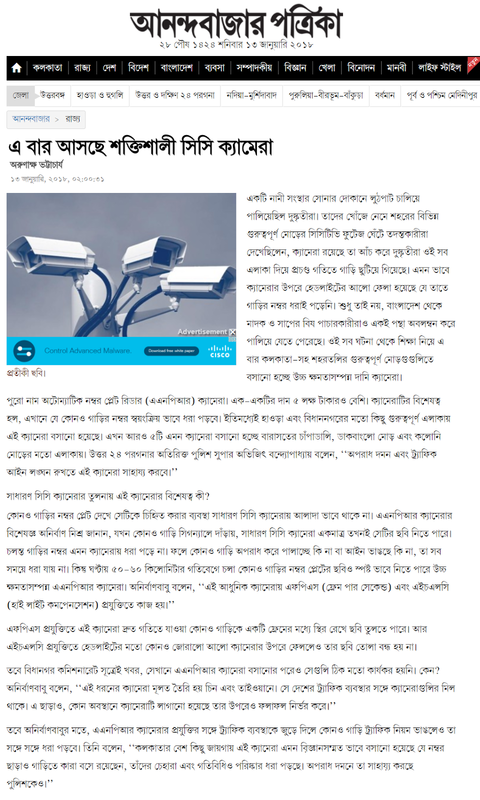 ক্যামেরা (ANPR / LPR Camera ) ? ৩. প্রচার - একটি অন্ত্যন্ত গুরুত্বপূর্ণ অধ্যায়, সকলের জ্ঞাত হওয়া উচিত এই পরিসরে ক্যামেরা বর্তমান, রাস্তায় সুরখ্যা লাইন পারকরলেই ক্যামেরা তে ধরা পড়বে, তাহার জন্য মোটা অংকের জরিমানা হতে পারে.